1. Before the modern era, polio was a mild disease seldom resulting in paralysis. 2. The largest epidemic occured about 1950 and had significantly declined by 1955 when vaccine was first introduced. 3. Disease can not be 'conquered' without addressing the disease cause. 4. Disease is not caused by a lack of "cow-pus", rotting material or carcinogenic poisons in the bloodstream. 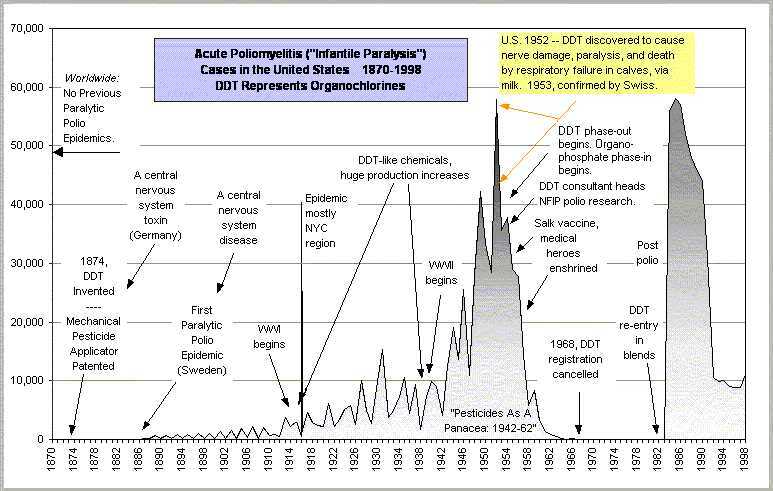 The fact that polio incidence increased after WWII and was only a minor problem before 1900 are clues that polio was a man made disease mainly caused by chemical polution, most notably persistent pesticides which were used very carelessly. Sometimes parks were sprayed with DDT at the same time children were playing. Flys on milk cows were sprayed with not a thought of contaminating the cow's milk and thus poisoning children as a result. 6. Creation of and introduction of the Salk vaccine was motivated by fear that, without the vaccine, contributions to 'polio research' charities would drop. Test results on the Salk vaccine were biased by throwing out polio cases 'after the first vaccination'. Test results were also biased by including only data from the '11 most accurate states' while ignoring the data from the other 33 states included in the test. What would the '33 least accurate states' data have shown? 7. Introduction of the Salk vaccine was beset first with known deaths related to the vaccine and then by a rise in polio cases. 8. Truth of the vaccine's true detriment was withheld from the public. Several states had rises in polio rate following vaccine introduction. The definition of epidemic was changed from 20 cases to 35 cases [per 100,000]! 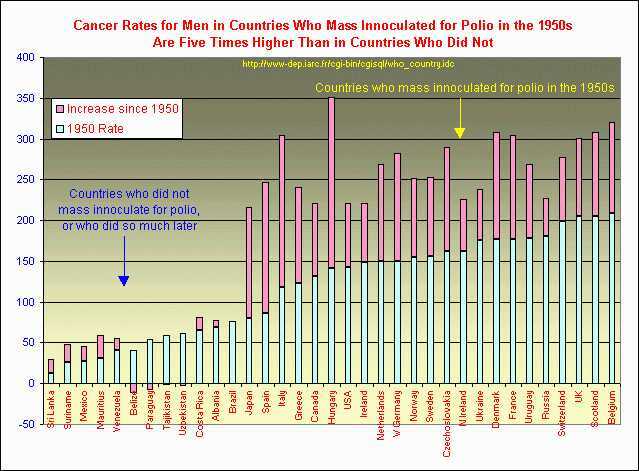 The definition of polio was changed from paralisis occuring for 24 hours or more to paralisis occuring for 2 months! The remaining polio cases were then diagnosed as meningitis! Note: The increasing sized black bars indicate larger numbers of 'reported' (Notified) cases of polio following vaccination. 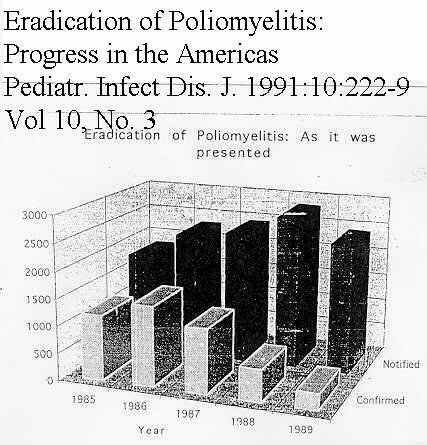 The decreasing sized grey bars indicate the fewer cases of polio were 'confirmed' thus allowing the false claim that the vaccine was working. 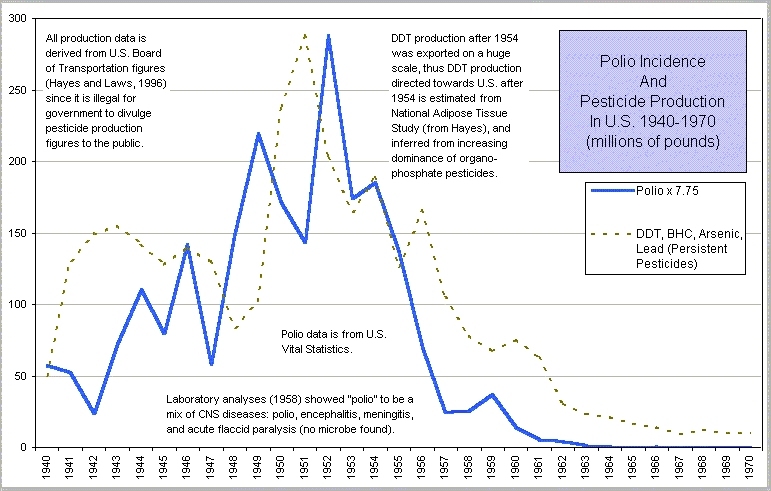 http://www.harpub.co.cc/pol_all.htm With 3 wonderful graphs relating DDT/etc to polio cases. The following graph gives one an idea of what the world wide damage per year might be from the contaminated Polio vaccines. A chapter from the book Diet Prevents Polio written by Benjamin P. Sandler, M.D., and published in 1951, at the height of the polio epidemic. In 1938, the only laboratory animal that could contract polio by experimental inoculation was the monkey. [Rabbits were completely immune to polio...] The next step was to lower the blood sugar of the rabbit to subnormal values with insulin injections, and then inoculate the rabbit with polio virus. This was done and it was found that the rabbits became infected and developed the disease. The Origin of the 42-Year Stonewall of Vitamin C Landwehr, Journal of Orthomolecular Medicine, 1991 "Dr. F. R. Klenner, Reidsville, N.C.: It might be interesting to learn how poliomyelitis was treated in Reidsville, N.C., during the 1948 epidemic. In the past seven years, virus infections have been treated and cured in a period of seventy-two hours by the employment of massive frequent injections of ascorbic acid, or vitamin C."